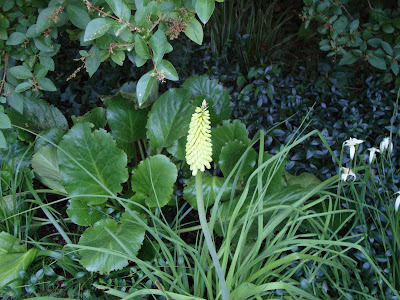 danger garden: How do you say Kniphofia? 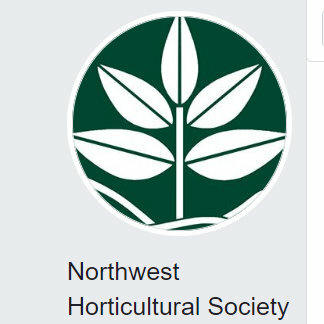 Hearing Sean Hogan (owner of Cistus Nursery) pronounce Kniphofia during one of his talks at the Yard Garden and Patio Show in Portland was a highlight for me. 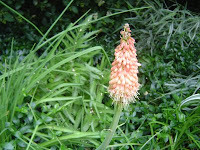 I had been muddling my way through that name for years and had finally given up and started calling it ‘red hot poker’ – a name I abhor and doesn’t really work for me anyway because I tend towards the lime, yellow and orange end of the spectrum for my Kniphofia. 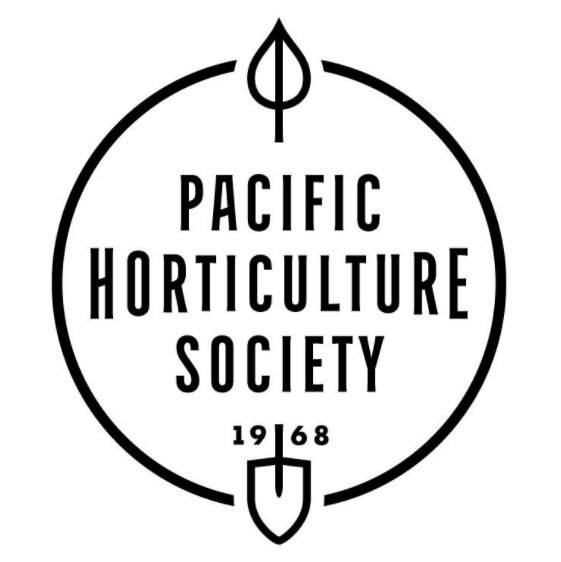 Luckily since then I’ve discovered the Fine Gardening pronunciation guide where I can hear most any Latin plant name pronounced. Of course that is no guarantee that I’ll remember the name, but it is a handy tool. Back in June when we put up the Shade Pavilion, I blogged about the fact that this Kniphofia had changed its color and was now orange…it had always been lime green! Well, it’s back to lime green. Only the one flower was orange (shown above). Odd. 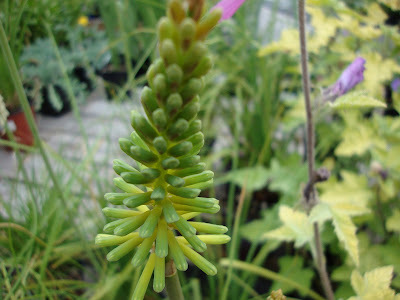 I bought these little Kniphofia to replace a couple of Heuchera that couldn’t stand the heat. I didn’t expect them to bloom this year, I thought they were done for the season, yet right before our heat wave they started pushing out these tiny citrusy spikes. Unfortunately I seem to have lost the tag so I can’t tell you their name! 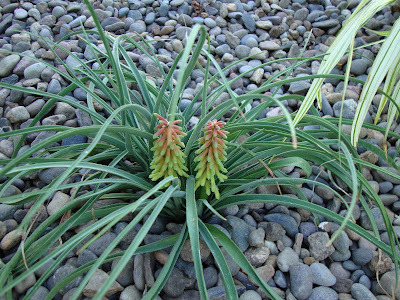 Below are Kniphofia Caulescens, they were part of my initial planting in the front yard when we got rid of the lawn but they went absolutely crazy and overgrew their space. 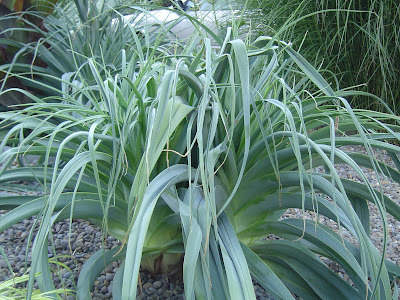 The older thick juicy leaves would turn purple and then dry up. They were a maintenance nightmare but I still loved them for their Jurassic proportions. 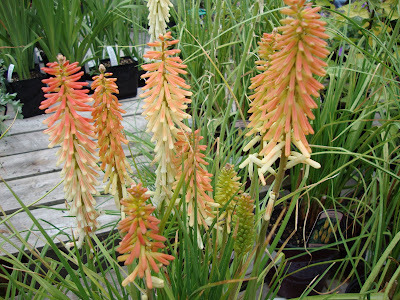 There are so many different varieties of Kniphofia, I spotted these at Portland Nursery last week. The first one is called ‘Peachy Cheeks’ and the second is ‘Vanilla,’ they called out to me but I somehow managed to leave them behind. 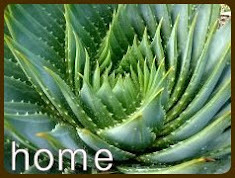 Love your collection of these plant and you are tricky, didn't produce the pronunciation! Of course I had to go right to your neat resource and try it out - had NO idea how wrong I was pronouncing it! Maybe poker/knife are similar so that could be a mnemonic? I also had to find out how incorrectly I've been saying Weigela, Stipa and Thuja. 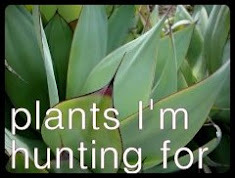 Man, makes me not want to say any plants out loud ever again! Or maybe use the nifty tool to learn one a day or something. Thanks, great post! I think knowledgable people can disagree on that Latin stuff...or maybe it's susceptible to individual accents? I base this upon having heard Christopher Lloyd pronounce something one way, and Dan Hinkley another. Fun, though, isn't it?...and you can really sort out the snobs by how they react when you get it wrong. Interesting. We read an article about kniphofias and since they're named after Mr. Kniphofia, and he pronounced his name with the "K" we've always done so. Anyway......I really like the ones that aren't the red/orange color. I don't know how I got through all this time without one of these (lack of sun? ), but I'll fix that next year. 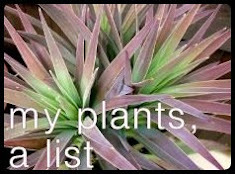 I realize I had been saying this plant name in my head with letters that aren't in there. Now I have to check out what Karen said. I wonder how you do pronounce Stipa. My 'Bressingham Comet' was a sort of tangerine color last summer, which I loved. This summer the pokers are starting off darker orange and fading to yellow. Wonder what will happen to the color next year? 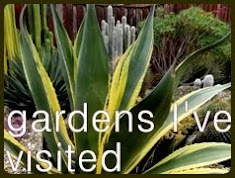 Ahhh, the pronunciation of Botanical Latin.... perhaps this explains why I simply had to add a Peltoboykinia watenabai to the garden this year.... interesting enough looking plant, but the tongue twister that it has since become for visitors to the garden..... LOL! Karen, oh god you think like me, I love your mnemonic device! My pronunciation is horrible. I just can't wrap my tongue around half those names! Ricki, so true! Accents/region has got to play a part in individual pronunciation. As long as we all know what we are talking about, right? Of course there are a few I've butchered so badly that nobody could have figured it out! 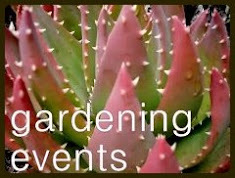 Jane, the one you pictured recently on your blog is gorgeous! Must be the 'yellow stage' you speak of? 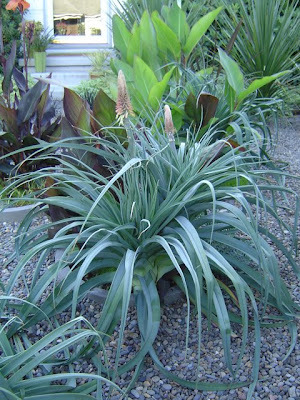 Not to brag or anything, [ha, ha] I've been pronouncing Kniphofia correctly. [I checked FG to make sure because I was having doubts.] 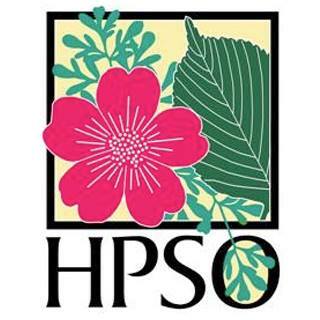 However, before you think I'm some really awesome smart person, I'll humbly admit that the credit goes to Sean Hogan who used to be a regular guest on Mike Darcy's gardening show. 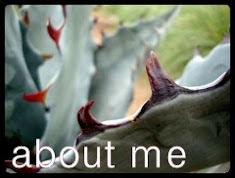 I more often than not mispronounce [and misspell] a plant but I like what Ricki said, the snobs will point out your error. Named afer Kniphof (Johannes Hieronymus Kniphof (1704-1763)I would pronounce it Knip-hof-ia, only the ia is latin the rest german/dutch. So you pronounce the K and Knip and hof are seperate words. k-nip-hof..ia...the "k" is not silent. Can't say I'm ever going to pronounce it like that but...that's the correct way to say it. As above.